I’ve been an artist for 37 years. My artistic endeavors began with calligraphy and then moved into making books, slowly transitioning from books with text to wordless ones with natural materials. I am inspired by the spirit of nature, both wild and cultivated, and the beauty and power of words. I have been making Spirit Books, my most significant body of work, for the past 22 years. They bring together my love of the book and my response to the natural world that we see and the invisible one that lies behind it. I feel a deep connection to older powers as I gather twigs, branches, vines, and roots. Using them to cradle books, I link them to the longstanding tradition of books as testaments of faith and belief. Each page is a meditation that echoes nature with both repetition and variety. “Reading” the book is meant to be a contemplative experience that takes the reader out of the everyday world and into a state of gratitude and reverence. I grew up in New Jersey. I loved reading, wading in the Rahway River, playing with friends, and spending time in my grandfather’s garden. In high school I was a serious student and determined athlete. I had no natural ability to draw so I never considered the possibility of life as an artist, but I loved making things: embroidery on jeans, jackets, and pillowcases and calligraphy on pages of plain paper with watercolor backgrounds. I majored in English Literature in college which had a lot of influence on my work as an artist. I am mostly self-taught at what I have done for work in my adult life—calligraphy, bookmaking, graphic design, public speaking, teaching. What I learned as an English major enabled me to take much of my education into my own hands. I learned to take a red pen to everything I wrote. In my art, I continually review my lettering, bookmaking, teaching, and speaking performances with a metaphorical red pen. When I first moved into visual art, I felt so out of my element, so insecure about not having an art degree, that I gave little credit to the degree I had. It was a surprise, then, when I was preparing my first talk about my art life several years ago, to realize that I approach art like an English major. My interest in working in series comes from my immersion in literature. I didn’t read one play by Shakespeare, I read them all. I spent four months with his comedies and another four with his tragedies. I spent a semester reading Edmund Spenser’s The Faerie Queen. I came to expect a digging in and a digging down, a sustained exploration of an idea. I feel like there is a part of me that at some level is always thinking about or gathering for my work. While it is a constant in my life wherever I am, I feel so lucky to have a studio in the house. I love having a separate space that I can go in and work at any time. The studio is long and narrow with a slightly wider space at each end. In the front is my computer where I spend a lot of time: designing books, playing with images in Photoshop, and taking care of business and communication. The middle part is mostly storage of work in progress and finished pieces. The back end has a skylight above and is the brightest and sunniest part. I try to keep the work surface clear when I am not working on something in particular. I find open spaces to be invitations to do more work. The most surprising thing to me is that I now do a fair amount of public speaking. When I started as an artist, I think the ability to work alone was an attraction. While it might not have always seemed that way to others, I was shy and liked the quiet time of interacting only with the materials and the work. I first became comfortable standing up in front of large groups when I taught bookmaking to children in schools as a traveling teacher for over 20 years. Even when I was completely comfortable in front of a room, the idea of talking about my work made me nervous. With teaching I was guiding an activity and I felt it wasn’t really about me. When I had to speak about my work, I felt exposed. The turning point came in 2005 when I had an exhibition of the Spirit Books at the art gallery at Regis College in Weston, MA. I was so concerned that I didn’t have anything deep to say. I decided that I wasn’t going to worry about it and just explain my thoughts and process as simply as I could. To my surprise, the group of over 50 people, many of them people I had never met, were completely attentive and afterward told me how much they enjoyed my talk. I felt empowered. The idea that I could speak plainly from the heart was liberating. I now have a talk, Art Lessons: Learning From Our Creative Experiences, about my development as an artist and what I have learned about role of patience, the development of the critical eye, and the struggle with perfection. I never expected I would be doing this when I was spending day after day practicing calligraphy at my dining room table 37 years ago. The studio is the first place I want to be in the morning. Since I’m often drawn in before I get dressed, I always make a point of getting pajamas that that I could answer the door in. Recently I have been altering my schedule to have a walk first so I can get some exercise in before I start. Otherwise, it can be the end of the day and I haven’t left. I try to save handwork (stitching Spirit Books pages and other repetitive portable tasks) that I can do anywhere for evenings. In the past five years, I have recommitted to the Spirit Books. I thought I had made the last one in 2005. I’m not exactly sure why I felt the need to stop but I think it had something to do with not wanting to be defined so closely by one body of work. After five years, I found that I missed making them and returned to them. I only make 4 to 8 per year but feel they are the anchor of my work and ground me. I started in art with calligraphy which I did very seriously and exclusively for about 10 years. I focused on books for the next 25+ years but always used lettering for personal things—making cards, addressing envelopes, writing notes. In the past five or so years I have incorporated more calligraphy into my work. I’ve done several installations: lettering quotes from Nathaniel Hawthorne at his birthplace in Salem, MA and outdoor sculpture projects at Maudslay State Park and for the upcoming Flying Horse Outdoor Sculpture exhibit in South Hamilton, MA. 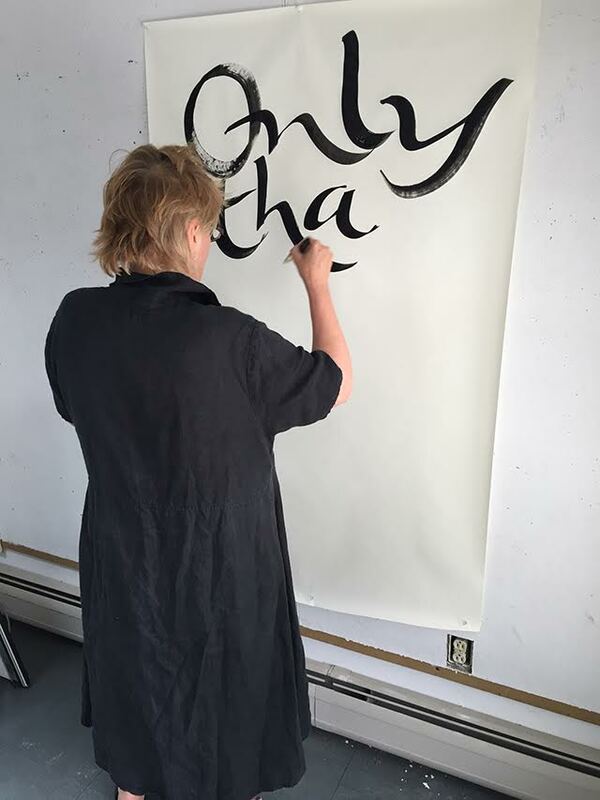 When I was doing calligraphy as my main work, I viewed myself as an interpreter of the words. Each piece used different colors and lettering styles and added elements. I am going back to quotes but my goal now is let the words to speak for themselves. I’ve always been more about process than product and have tried to let my work evolve as organically as possible. I am trying for that more and more. In a Christmas letter in 1513, Fra Giovanni Giocondo instructed a friend to “Take joy.” That is what I am trying to do—to have every moment of creation be one of joy for me. I grew up in a house full of creative activity with a mother who knitted, sewed, cooked, and engaged in craft making of all kinds—melting wax for floating candles in bowls with flowers in summer and gathering milkweed pods for the wings of angel ornaments in winter. She was my first influence. The artist who has had the most profound influence on me is the late Jenny Hunter Groat. She was a dancer, calligrapher, and painter, and a Zen Buddhist. After a weekend workshop on Notan, the Japanese design principle of light and dark, I began a long correspondence with her. I also spent a pivotal weekend at her retreat workshop called Knowing/Not Knowing at Green Gulch Zen Center in her native California. She encouraged me to follow my own voice and gave me the confidence to do so. I consider myself to be both an artist and a teacher. I feel that I am artist at my core and teach because I want to share what making art has brought to my life. I would rather teach someone to make something than have them buy something from me. Even though I believe that my purpose in life is to make and share art, I have occasionally felt so frustrated with the business part of being an artist that I have said, “ Maybe I should do something else.” I’ve never pursued them but professions that sound appealing are florist, exhibit designer, copyright lawyer, and behavioral economist. 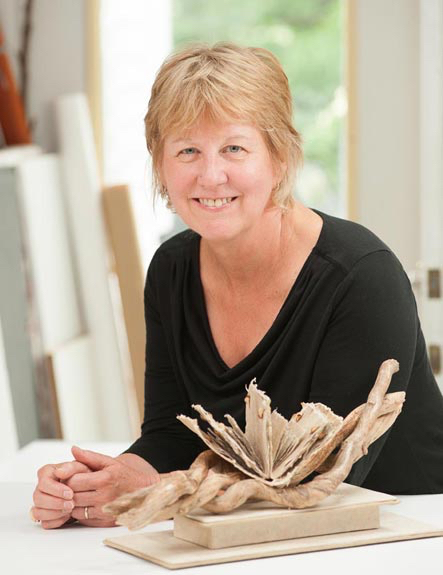 Susan Kapuscinski Gaylord has been working as a visual artist since the late 1970s. 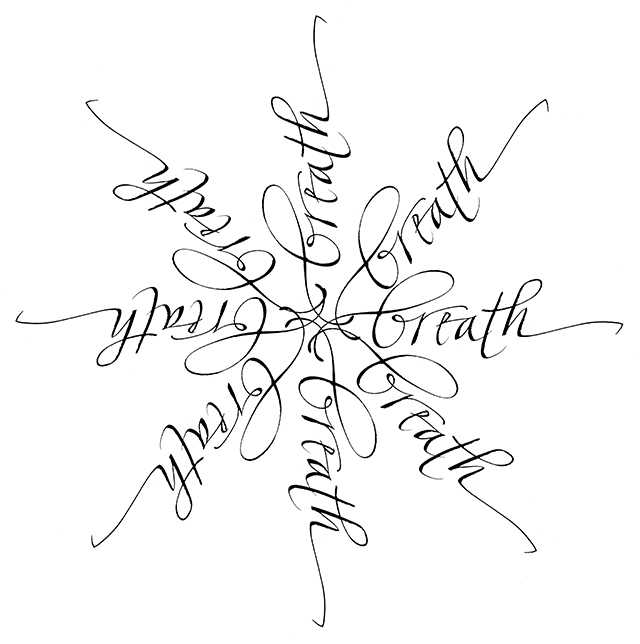 Ten years of calligraphic work were followed by involvement in book arts where she is best known for the Spirit Book Series and her website, makingbooks.com. She currently blogs at susangaylord.com, teaches and lectures about book arts and her journey as an artist, and works with hand-lettering, digital compositions, and bookmaking. Her work is in the library collections of the Museum of Modern Art, the University of Arizona, Wellesley College, and Yale University. 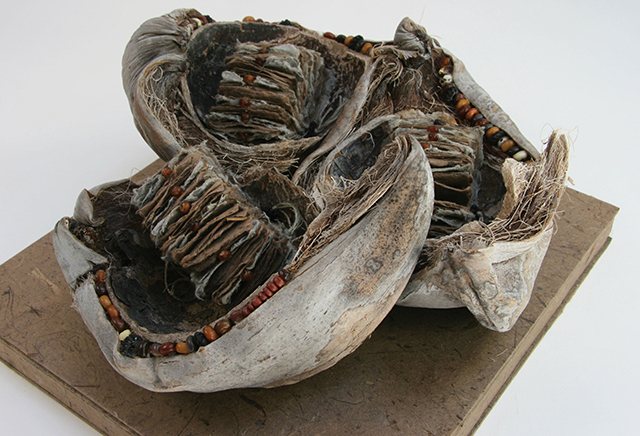 It has also been featured in solo and group exhibitions in museums and galleries throughout the United States and in Canada and Korea, including the Center for Book Arts in New York City; the Art Complex Museum in Duxbury, Massachusetts; the University of Indiana Art Gallery in Indianapolis; the Milwaukee Institute of Art and Design in Milwaukee, Wisconsin; and the Seungnam Book Fair in Seungnam, Korea. Her work is well-represented in print with features in magazines (Urthona: Buddhism and the Arts, Somerset Studio, Fiberarts, and Letter Arts Review) and books (500 Handmade Books, Cover to Cover and the Art of the Handmade Book by Shereen LaPlantz, and Handmade Books And Cards by Jean Kropper). 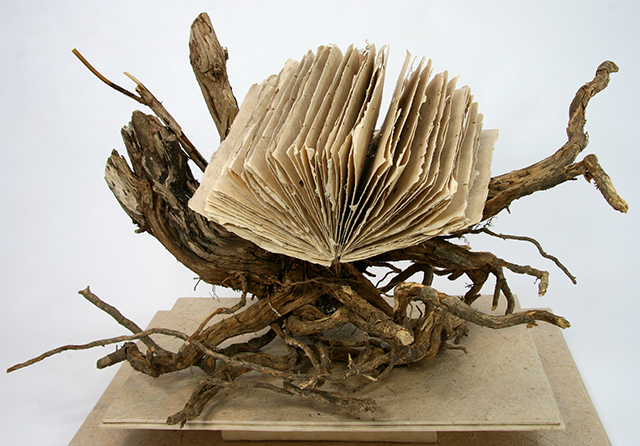 This entry was posted in Altered Book, Book Arts and tagged artist´s books, book art, calligraphy, nature, New England. Bookmark the permalink.